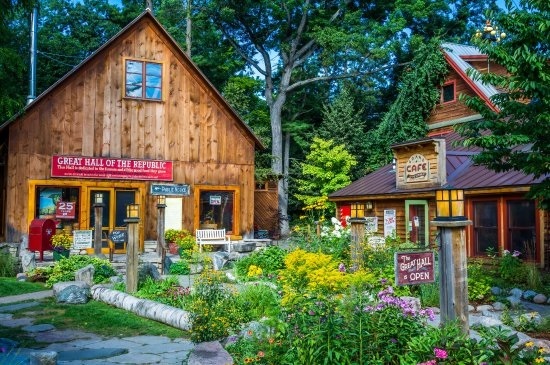 Glen Arbor Rental, Glen Arbor Vacation Rental, Leelanau Vacation Rental, Ski Resort, Homestead Resort. Tastefully decorated home that just make you feel at home. While placed in an up north wooded setting, enjoy downtown Glen Arbor a block away and the ever so popular Lake Michigan or Glen Lake. Stroll past quaint shops and enjoy local ice cream from the Nation's number one ice cream...Moomers! Tennis, Basketball, and Pickle Ball courts with a nice park are located behind the property. If sports are not your forte, then take a stroll along the long walking path! Open the door and see the first floor and immediately walk into the living room. The kitchen and dining room have an open concept. The dining room table has expandable leaflets for families of every size, and a granite countertop and comfortable counter stools in the kitchen. Has screened in porch with table and chairs. A flat-screen TV is located in the wooden corner cabinet off of the living room. Both bedrooms downstairs have a queen bed and large closets. A full bathroom, a linen closet with plenty of towels and linens, and a laundry room with full size washer and dryer, complete the first floor. You’ll love the huge loft area upstairs, which includes a tile shower and another linen closet big enough for hanging clothes. Upstairs you will see an easy chair and ottoman, rocking chair, another queen size bed and a spacious sitting area with a queen size sofa sleeper. Not to mention great views of both the lower level and the beautiful exterior surroundings. The home has lots of windows to enjoy the cool nights “up north”, and air conditioning if necessary. This home is well heated and cozy for non-peak season visits. Sandy Shore has wifi and cable (during peak season), but we know that you’re here for the outdoors. You’ve come to the right place! The home sits on a beautiful wooded lot. In addition to the screened porch, there are two large decks, front and back. Grill a steak or your “catch of the day” on the natural gas grill on the back deck. Enjoy a cocktail while enjoying a bonfire in the firepit (no need to pick up firewood; there’s plenty in the woodshed). 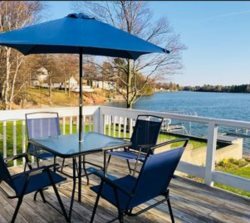 We’re sure you’ll enjoy staying at this well maintained, beautifully landscaped, newer home in gorgeous Leelanau County. First and foremost, there’s Sleeping Bear Dunes; great for kids and adults alike. Hike up (and run down) the Dune Climb, drive Pierce Stocking, spend the day at the beach, hike at Empire Bluffs or Pyramid Point, visit Fishtown in nearby Leland, or take the boat from Leland to the Manitou Islands. Looking to golf? Perfect area for that! Fantastic courses abound in Grand Traverse and Leelanau Counties, or try the miniature kind in town. Kayak, canoe, or just float down the nearby Crystal or Platte Rivers. And shop at great local shops and galleries for that special gift. Go to a concert at the Interlochen Center for the Arts or at the City Opera House in Traverse City, or try your luck at the Casino on Grand Traverse Bay. Visit one of the Peninsula’s vineyards for a wine or cider tasting. And of course, there’s the National Cherry Festival and more! You won’t lack for something to do unless you want to! Additional services available include, transportation/limousine service, in-home private spa services, boat or jet ski rentals, para-sailing (for you brave ones), or hot air balloon rides, and virtually anything else requested by the guest.